When you really want or need something, it can be pretty easy to ignore the risks associated with acquiring that thing. People may try to warn you about things, but those warnings may fall on deaf ears. After all, when you’re really in need of something, it can often feel that you have really have no choice but to acquire it. And when you’re in that mindset, the risks may seem completely irrelevant to you. You should do your best not to get into this way of thinking. We’re going to look at the risks that are associated with borrowing money. Please do keep them in mind, even if you feel that the situation is desperate. There are plenty of lenders out there who are ready to take advantage of people in desperate situations. Technically, you could say that all lenders do this. But there’s a difference between the people who are running a lending business who actually have ethical and moral codes, and those who are simply looking to take cash-strapped people for a ride. No matter how desperate you feel you are, check the reputation of any lender you’re thinking about working with thoroughly. A loan is a loan is a loan, right? Not quite. 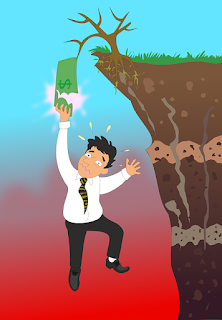 There are so many different types of loans out there, and choosing a type that doesn’t work well for you in the long run could put you in an even worse financial predicament than the one you’re already in. So you should always ensure you take the time to research all the types of loans available to you so you can pick one that works best. For example, if you can't afford to use assets such as property as collateral for a loan, then you should be looking into unsecured loans. If things go wrong with this loan, then your credit score can take a huge hit. And if this happens to you, then it can be incredibly difficult to get your hands on another loan in the future. This risk is something you must always keep in mind. Most of the decisions you make and actions you take regarding this loan is going to have some sort of implication for your overall creditworthiness. Take this into account and tread carefully! A lot of people make the mistake of forgetting that loans need to be thought of in terms of affordability. They imagine loans as something that provides money in the short term and costs money in the long term, but often don’t think about it in much more detail than that. This is a mistake. You need to do some budgeting so that you know you can afford the loan from the offset - there are, after all, numerous fees to consider - as well as in the months ahead. People who aren’t careful enough with their lending may find themselves falling into a debt spiral. This is precisely what it sounds like: an incredibly uncomfortable path in which the lendees find themselves having to borrow more and more money in order to pay off loans they've already taken out. Be careful from the offset and you should be able to avoid this.